You don’t have to book or let us know you’re coming; just turn up! If you want to get in touch, use the “Leave a reply” box on on any of the pages of the site. You can also email the site at easycycle.20.jimcameron[at]spamgourmet.com (just replace the [at] with an @). I wonder if you have planned a September bike ride since I will be busy on 30 Aug and am keen to dust the bike down and remember how to ride it! Yes indeed. We’re moving to a last Sunday (rather than last Saturday) ride from September so we’ll be out on Sunday 28 September. Is there a good place to park near the start. Will be driving in from Lanark way. Sorry for the late reply (and I think I met you on the May Easycycle) George Square and Buccleug Place are both close to Peter’s yard in the Meadows. 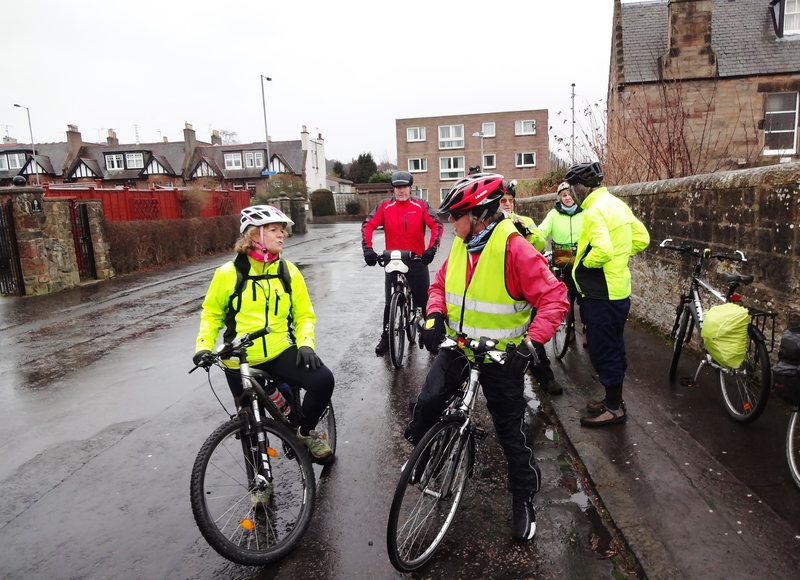 Hi Jane, the Easycycle Group is only out and about on the last Sunday. I’ll forward your note to the regular attenders and maybe they would like to participate individually. I plan to come along tomorrow for the first time. I will be coming in by train, but good old Scotrail’s timetable on a Sunday from Dalmeny means that my timing will be a bit tight (or arriving an hour and a half early!) – I was wondering if you tend to leave on the dot of 10.30, of if typically it’s a little after that once everyone has congregated. I should be there on time, but if the train is a few minutes late I would hate to just miss you! Hi Jo, sorry I only just got your email. We wait at least 5 mins and sometimes longer depending on the ride. if you drop me an email on the day you travel, including your mobile number, we’ll arrange to wait for you! Three of us are hoping to come for the ride tomorrow (26/11/17). I just wondered, with the level of ice there was this morning, does the ride still go ahead if it’s really icy? Also wondered what the route is like for tomorrow? Apologies Sarah, I was away and didn’t pick up your email. Our policy is that the leader will vary the ride, including shortening it or cancelling it, if it’s not safe. E-bikes are fine Ellen. Look forward to seeing you on Sunday!